When you get a big basket of peaches as beautiful as this, it’s time to cook. We got these in South Carolina a few weeks ago while visiting family, and they were so fresh and sweet that the smell made me want to bury my face in the basket. They still needed a couple days to fully ripen, but when they did the juiciness and flavor immediately made me think of peach butter and peach cobbler. It also made we want to go out and “take care” of the squirrels that ate all of our peaches this year. I’ve been making small batch preserves this year, which is handy since our freezer is bursting at the seams. 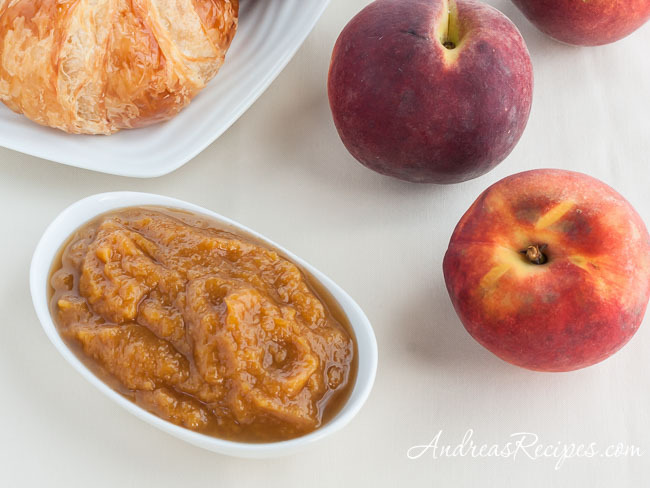 Peach butter is so simple and I actually prefer it over peach jam. The texture is reminiscent of apple butter and it only needed a small amount of sugar because these peaches were so sweet on their own. 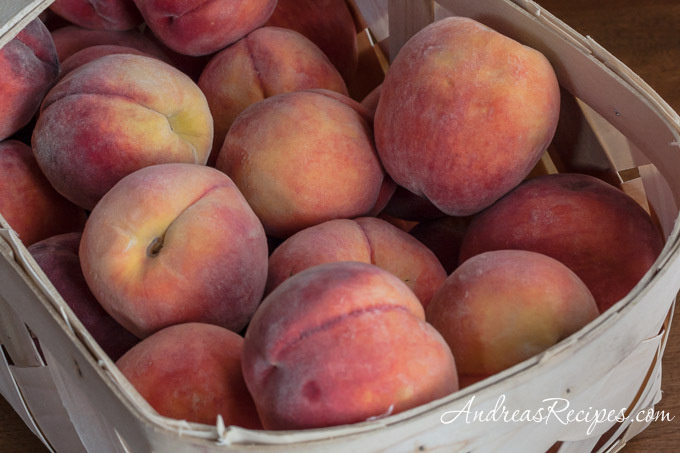 Taste the peaches you use before making the butter and adjust the sugar to your preference. I like to spice these up a bit with cinnamon and nutmeg and dream of breakfast while peach butter simmers away on the stove on a hot summer day. 1. Pour the peaches into the sauce pan and add the lemon juice. Bring to a boil, then reduce heat and simmer about 5 minutes. The peaches should turn mushy. 2. Blend the mixture with an immersion blender or in a jar blender until very smooth. 3. Return the pureed peaches to the pan and add the sugar, cinnamon, and nutmeg. Bring to a boil, then reduce the heat to low and simmer uncovered until the mixture is thick, about 25 minutes, stirring frequently. 4. Remove from heat and cool completely. Store in a jar in the refrigerator or freezer. Will keep for up to 3 weeks in the refrigerator and 3 to 4 months in the freezer. Hmmmm…I made this last week and threw in a large can of pumpkin and simmered it all day. It is great! That looks fantastic! I love peach butter and those spices look delicious! I stumbled upon your site through Twitter and happily so! I happen to have a box of peaches, and I will have to try your recipe before the season ends. Thank you for sharing! Okay, I’m ready for this. Just finished my Fig-Raspberry Jam and Fig Fruit Rolls, so bring on those peaches! And, I love Gail’s idea of throwing in some pumpkin. That would make some great fruit rolls for fast breads later in the year! Thank you, both, for some great ideas. This looks delicious. I love the addition of cinnamon and nutmeg, two of my favorite spices. I need to stock up on peaches so I can try this. I just made this and love it. It’s just the right amount for me. I added just half the sugar and it filled up a jar with a bit left over (I also cooked mine extra long by mistake!). It’s really yummy, and I love that I could do it! Great, I’m so glad you enjoyed it!